Raj told Sonny (Maurice Benard) his first born had decided he wanted to be a part of Raj’s organization. And now Dante (Dominic Zamprogna) had the chance to prove it by killing his father. “What are you doing?” Sonny asked his son. “Getting everything I want,” Dante answered then shot Sonny in the shoulder. He told Raj that Sonny was more useful to them alive. At General Hospital, Finn (Michael Easton) rushed into Anna’s (Finola Hughes) room as he was paged she’d been admitted. He was shocked that it appeared her blindness had reoccurred when “Anna” told him she couldn’t see him. But then the real Anna entered. It seemed Finn was talking with Dr. Alex Marick (also Hughes), who said she looked forward to seeing him once he cured her. Alex flirted with Finn in front of her twin, praising his medical skill based on what she’d read about him. Finn was skeptical about risking his medical license to treat a fugitive. Alex assured he wouldn’t lose his medical license. Anna told Alex about Dr. Cabot’s memory transfer study and demanded to know which memories were hers (Anna). 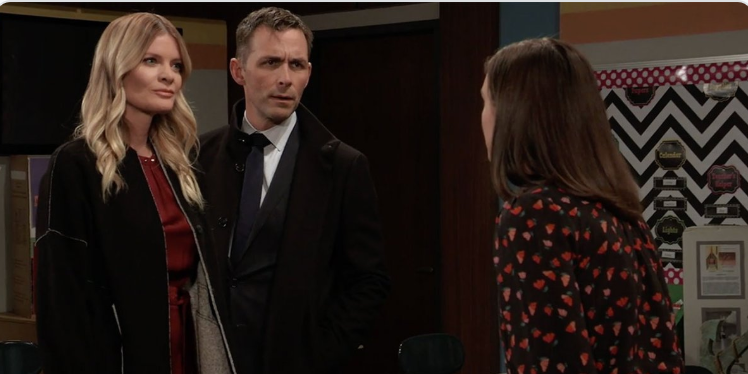 At The Floating Rib, Sasha (Sofia Mattsson) told Peter (Wes Ramsey) she wanted to talk about Nina (Michelle Stafford) and Valentin’s (James Patrick Stuart) wedding and hoped no one did anything to ruin it. Also at The Floating Rib were Lulu (Emme Rylan) and Maxie (Kirsten Storms) who discovered Amy’s brother Chet was working there. Peter later told Maxie he thought Sasha was on to them (wanting a new DNA test). Carly told Mike (Max Gail) and Michael (Chad Duell) she and Sonny were going to have a baby. Marcus offered to get tested to be a donor for Jordan (Briana Henry). Curtis (Donnel Turner) brought Jordan so clothes as she was being released from GH. Jordan was surprised to learn Curtis thought about having children. Alex urged Anna not to pursue the memories. Sonny realized Dante grazed his shoulder as part of his cover. He then told Dante about Lulu being stabbed. Dante told Sonny about what happened the first months of his undercover work. Sonny said Dante should convince Raj that Dante would kill Sonny. Alex (Finola Hughes) savored her coffee cup full of tea as she missed the brew. She thanked Finn (Michael Easton) for making it for her but he told her it was to get her to cooperate with them. Franco (Roger Howarth) asked Elizabeth (Rebecca Herbst) whether he’d have to check into a hotel room upon his release from General Hospital. Liz explained that although her heart wants them to be together, she’d have to put her kids first. Franco told Elizabeth to take as much time as she needs. Cameron (Will Lipton) looked at the Niagara Falls photos with Josslyn (Eden McCoy) while they visited Oscar (Garren Stitt). Josslyn received a text about being invited to participate in a volley ball tournment at PCU. Oscar suggested another road trip. But Joss didn’t want to tell him the event was scheduled for August 9th. Julian (William deVry) came to GH with coffee for Drew (Billy Miller) and offered food and support to Kim (Tamara Braun). Sonny’s (Maurice Benard) plan was for Dante (Dominic Zamprogna) to pretend to kill him. Corinthos assured it had to work. Sonny told Dante that Carly was pregnant. Drew gave Franco the coffee from Julian. Franco commented that he didn’t know whether’d he go after leaving the hospital. Cameron said if Franco really cared about Aiden and Jake (Hudson West), he’d leave them for good. Julian told Kim he hadn’t heard from Ava (Maura West) and hope she wasn’t LONE because that was the worst thing for her. Meanwhile, Ava arrived at the Corinthos house drunk demanding to see Avery. Carly (Laura Wright) told her Avery was spending the night at the Quartermaines. Ava was on a self-pitying journey blaming herself for alienating Kiki (Hayley Erin) and then taking up with her killer. She asked Carly to tell her what to do. Carly assured Ava out of all the terrible things she’d (Ava) done, Ms. Jerome wasn’t responsible for Ryan (Jon Lindstrom) killing Kiki. Carly urged Ava to call someone to pick her up; Ava called Julian. Cameron brought Franco some gifts from Jake and Aiden. Alex agreed to tell Anna which memories were hers only if Dr. Finn restored her sight and guaranteed she didn’t spend any prison time. Oscar’s test results were in. Elizabeth told Franco that he’d been more of a father to her boys than their own fathers and said she couldn’t take that away from them. Then, Liz asked her husband to come home with her. Dr. Terry Randolph (Cassandra James) delivered the sad news that Oscar’s tumor had grown and that he only had a month to six weeks left. Oscar requested everyone leave the room but Kim. Once alone, the teen delivered a touching tribute to his mother for making him what he is. He told Kim how glad he was that she was in his life. Kim called Oscar her greatest accomplishment. Then, Oscar cried in his mother’s arms that he was scared. Sam (Kelly Monaco) told Jason (Steve Burton) she had to see him because things with Shiloh (Coby Ryan McLaughlin) have gotten worse. Kristina (Lexi Ainsworth) discussing planting flowers for Dawn of Day’s beautification project. At The Floating Rib, Chase (Josh Swickward) asked Willow (Katelyn MacMullen) whether she’d like to go away with him for Spring Break. Afterwards, Michael (Chad Duell) talked with Chase about Shiloh and Dawn of Day. When Willow heard the name Dawn of Day mentioned and learned of Kristina’s involvement, Ms. Tait urged him to get his sister out of it. Shiloh said in order to advance to the next step, Kristina had to share a painful secret. Kristina told him how she blackmailed Parker, her teacher and the first woman she ever loved, for a better grade. Dante (Dominic Zamprogona) and Sonny (Maurice Benard) managed to over power the guard and Sonny switched clothes with the man. At the Corinthos house, Lulu (Emme Rylan) and Olivia (Lisa LoCicero) visited Carly, who told them she was pregnant. They discussed Sonny being in Turkey to bring Dante home. Olivia contacted Robert (Tristan Rogers) as she happened to have Scorpio’s cell phone number. When he answered, she put the call on speaker so Lulu and Carly could hear. Without going into details, Robert promised to bring Dante and Sonny home. Anna learned her memory of failing to save an operative named Boris because she froze was actually Alex’s memory. Michael came to see Kristina and wanted to go for a walk to get away from Shiloh and the Dawn of Day house. They ended up talking outside the house with Shiloh sitting by the window listening. He had an interesting expression on his face when Michael mentioned Willow was the one who warned Corinthos against Dawn of Day. Michael told Kristina he thought the money he loaned her was for PCU classes and didn’t like the hold Dawn of Day seemed to have on her. After Michael left, Shiloh told Kristina he was proud of her for the way she stood up to her brother. A frantic Willow called her landlord and said she had to break her lease. Alexis (Nancy Grahan) told Julian (William deVry) how she had therapy with Ryan (Jon Lindstrom) when she believed he was Kevin (also Lindstrom). 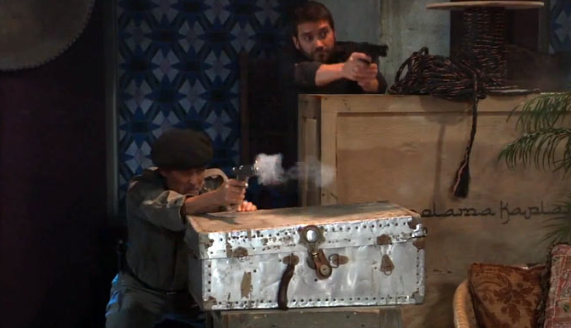 Dante and Sonny almost escaped Raj and his men but when Sonny saw the teen had been captured and was going to be killed, Corinthos sprung into action shooting some of Raj’s men. Raj took off running and Dante followed. Having no choice, Dante shot and killed Raj. Robert and his WSB agents arrived at the compound. Jason considered eliminating Shiloh but Sam warned Kristina would only blame herself if Shiloh turned up dead. Jason reminded Sam that once Sonny got back and knew what was going on with Shiloh and Kristina, Corinthos would handle the problem. But Sam decided the only way to save her sister was if Sam joined the Dawn of Day cult. Laura (Genie Francis) found Ava (Maura West) drinking on the docks. Ava called Mayor Webber “Lucky Laura” for marrying the right brother. Laura asked whether there was anyone she could call for her. When Kevin (Jon Lindstrom) walked into The Floating Rib, Mac (John J. York) was ready to throw him out. Kevin was able to prove he wasn’t Ryan by showing the date on his hospital admission bracelet was the same day when Ryan was in Niagara Falls. Mac told Collins he had two minutes to explain why he was there. Kevin said he wanted to apologize. Molly (Haley Puollos) called an emergency Davis Women at Kelly’s Diner. Shiloh (Coby Ryan McLaughlin) asked Kristina (Lexi Ainswoth) how long Michael (Chad Duell) knew Willow (Katelyn MacMullen). Meanwhile, Willow proof read her letter of resignation to Principal Schultz. Nina (Michelle Stafford) and Valentin (James Patrick Stuart) arrived. They wanted Ms. Tait to give Charlotte (Scarlett Fernandez) a recommendation for the gifted program or otherwise the little girl would have to test into it. Willow told Nina and Valentin that she couldn’t do that because due to a family emergency, she didn’t work there anymore. Kristina received a text asking her to come to Kelly’s. Sam left and headed for the Dawn of Day house and asked how she could join. Alex (Finola Hughes) asked Finn (Michael Easton) how with restoring her sight he knew she’d told Anna (also Hughes) everything. Alex warned Finn that Anna was always running off to right a wrong; Dr. Finn would never be enough for her. 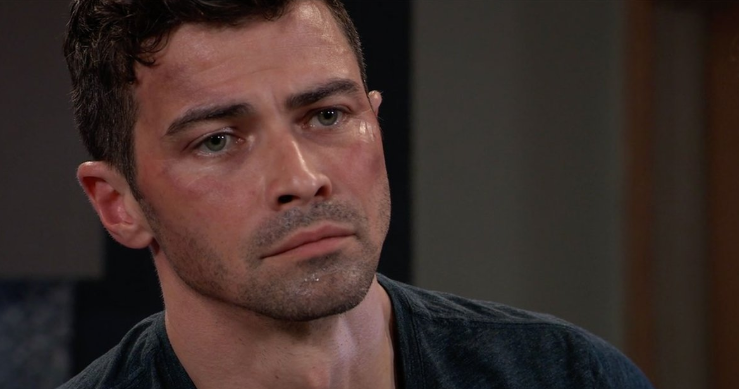 Griffin told Anna (also Hughes) how he could never understand how Ryan shook his hand and offered words of comfort when Kiki (Hayley Erin) died knowing he was the one who killed her. Laura arrived and asked Griffin to go to Ava feeling that the two people who loved Kiki the most could help each other through the grieving process. Griffin walked away but overheard Laura telling Anna that Kevin knew Ryan was alive. Willow said although Charlotte was very bright, she’s entitled and has no patience for others. Nina accused Willow of having a problem with her (Nina). Valentin thought it was a good idea that they leave. Willow wished Mr. Cassadine good luck with everything. Later, Alex called Valentin who refused to help her. Before she was taken into custody, Alex told Anna to tell Robert that she (Alex) was sorry she didn’t get the chance to see him. Willow was shaken when Shiloh appeared in her classroom. As he walked on the docks, Kevin was punched by a mysterious assailant. At GH, Sam (Kelly Monaco) updated Jason (Steve Burton) on Dawn of Day. She told him that Shiloh agreed to let her join but insisted on being her mentor. Carly (Laura Wright) rushed to General Hospital when she learned Sonny (Maurice Benard) was being treated for a gunshot wound. Sonny told Carly that Dante was the one who shot him in order to fool Raj and they planned worked and helped them escape. Jason entered and updated Sonny on the Ryan situation and Kristina’s involvement in Dawn of Day. Sonny wanted to have Shiloh eliminated but Carly reminded Kristina would only blame herself. Lulu (Emme Rylan) panicked when someone tried to break in. She was happily relieved when it turned out to be Dante (Dominic Zamprogna), who was only using his lock pick because she had changed the locks and he thought she was at work. They rushed into each others’ arms with Dante apologizing for not protecting her. Shiloh confronted Willow but assured that she’s still welcomed back in the Dawn of Day family. While they talked, Ms. Tait sent a secret text. Griffin (Matt Cohen) attacked Kevin (Jon Lindstrom) but was stopped by Ava (Maura West) who assumed it was because Munro thought it was Ryan. Griffin revealed how Kevin knew his brother was alive but didn’t tell anyone. After Griffin left, Ava questioned Kevin about his prior knowledge Ryan was alive. She suggested Kevin go to the hospital and get treated for the injuries sustained at Griffin’s hand. But as a police report would need to be filed, Kevin declined not wanting to cause a problem for Griffin. However, Kevin was arrested when a cop arrived on the pier and mistook him for his serial killer twin. D.A. Margaux Dawson (Elizabeth Hendricksen) told Laura (Genie Francis) her intention of charging Kevin with being Ryan Chamberlain’s accomplice since Dr. Collins knew his brother was alive but kept the secret. As Dr. Collins is the mayor’s husband, Margaux wanted to give Laura the chance to get in front of it politically before the story breaks. Chase (Josh Swickward) arrived at Willow’s classroom and noticed how nervous and uncomfortable she was with Shiloh. Willow lied that Chase was a parent and there to discuss his child. After Shiloh left, she told Chase she shouldn’t have texted her. But after her concern over Shiloh and Dawn of Day, Chase figured out that Willow had been involved with the cult and Shiloh was her baby’s father. Brad (Parry Shen) read to Juilian (William deVry) Liesl’s (Kathleen Gati) column about a person who adopted a baby’s worried about the medical history of the mother. Since Jerome believed Willow was the birth mother and didn’t think she had a history of mental illness, Julian questioned why Brad wasn’t worried about Wiley’s birth father. After Dr. Jones treated his hand injury, Griffin asked Lucas (Ryan Carnes) to write a letter of resignation for him (Griffin) and after saying goodbye to Carly and Sonny, Dr. Munro left GH for good.When Kevin was brought into the PCPD, Laura confirmed that he was Dr. Kevin Collins and not Ryan Chamberlain. However after he was questioned about whether he knew Ryan was alive and admitted he kept Ryan at Ferncliff and treated his brother, Jordan (Briana Henry) arrested Kevin as Ryan’s accomplice. Sam ran into Shiloh at Kelly’s Diner. Jason watched from outside as Shiloh told Danny that he hoped they’d be friends.